One of the biggest names in tripod manufacture, Manfrotto offers a huge range of tripods, monopods and heads to suit almost any requirement and budget, from tiny tabletop supports to fully professional carbon fibre kit. This reasonably priced combination, available for sale separately, comprises the 055XPROB aluminium tripod and new-generation 496RC2 ball and socket head. Despite weighing 2.9kg – slightly heavier than most competing tripods of its size and class – the maximum load capacity of the combined Manfrotto 055XPROB legs and 496RC2 head is 6kg. That's slightly less than the 8kg ratings of the Benro A-297EX and BH2-M head and the Giottos MTL9361B and MH1311652 ball head. The Manfrotto's rating is split between 7kg for the 055XPROB legs and 6kg for the 496RC2 head but, in our tests, the kit felt every bit as strong as the Benro and Giottos products. The legs are of the time-honoured three-section type, but the difference in diameter between each section is 5mm, compared with just 3mm in many competing tripods. The result is that the sections are particularly easy to extend and contract once you've released the high-quality and extremely effective clip-lock clamps. The section diameters themselves are a chunky 30mm at the top, 25mm for the middle section and 20mm for the bottom. Multi-angle legs are now featured on the vast majority of current tripods, but whereas most feature three alternative angles, the Manfrotto has four. 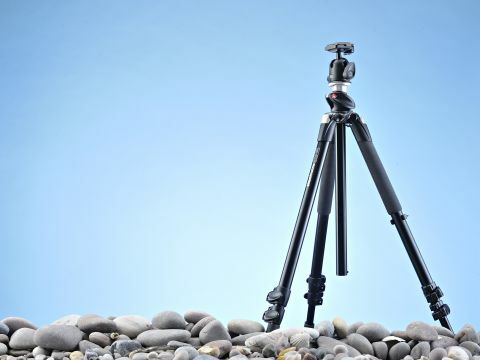 However, unlike the Jessops Major tripod, which also features four leg angles, the Manfrotto's legs can only be raised to a horizontal position, rather than being rotated almost vertically upwards. By opening the tripod's legs to a greater angle from the centre column, you can reduce minimum shooting height with your DSLR from 71cm to 58cm. To go lower than this, you need to remove and invert the centre column, shooting with the camera upside down. Maximum height with the legs and centre column fully extended is an impressive 187cm. The Manfrotto 055XPROB features a pivoting centre column, which is absent on its slightly cheaper 055XB tripod. This particular feature is good but not great, as we'll come to later. Other features include a bubble level on the tripod collar, but there isn't one in the ball head to help level your camera. The new-generation 496RC2 improves on its predecessor by including an adjustable friction damper, but there's no separate pan control.